by Francesca J. Fusco, M.D. Q. What is molluscum, and how do you treat it? A. It invades your skin. … It can spread all over your body—even to your friends! … And it’s downright, well, harmless, actually. Molluscum contagiosum is caused by a virus in the poxvirus family. (Smallpox is a cousin, but chickenpox, believe it or not, is in the herpesvirus family.) It’s characterized by solitary or multiple flesh-colored, dome-shaped bumps, approximately the size of a pimple. The center of a molluscum shows a tiny dimple—a feature that can help to distinguish it from other bumps, such as pimples and warts. They can be found anywhere on the body but are most common on the face, arms and legs. As the name molluscum contagiosum suggests, it is highly contagious and spreads easily—especially among children. It can also be sexually transmitted. 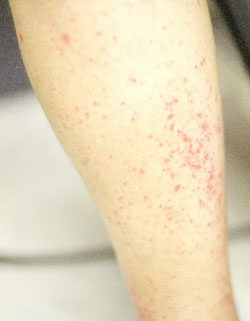 After infection, bumps may not show up for an estimated two weeks to six months. One of the topical treatments your health-care provider may try is silver nitrate, a chemical that basically burns the bumps off. Some companies sell products on the Internet that they say contain “silver” or other ingredients that they claim treat the virus. Buyer beware. The Centers for Disease Control and Prevention warns that products sold on the Internet may not only be ineffective; they could be dangerous. If you suspect that you might have contracted molluscum contagiosum, don’t panic. The virus only infects the outer layer of your skin and doesn’t cause the rest of you to get sick. But you should see your dermatologist to make sure it is, in fact, molluscum contagiosum. To prevent the spread of the bumps—either on your own body or onto someone else’s—keep them covered with adhesive bandages, and don’t scratch. The next thing to do is up to you. You can let the virus go away on its own. (This usually takes six to 12 months but can take up to four years, according to the Centers for Disease Control and Prevention.) Or you can have the bumps removed. This eliminates the source of the infection— the viral particles under the dimples. Personally, I recommend removal—and the sooner the better, to stop the bumps before they spread further. Your health-care provider can cut (my preference), burn or freeze the bumps off, apply a topical agent to make the bumps self-destruct, or prescribe something that you can apply at home. Bear in mind, however, that it can take several days or even weeks for topical treatments to yield results, and when dealing with a condition as contagious as molluscum contagiosum, time may be of the essence. FRANCESCA J. FUSCO, M.D., has been practicing dermatology in New York since 1989. She is also an assistant clinical professor of dermatology at the Mount Sinai School of Medicine. Photo courtesy Francesca J. Fusco, M.D. Last updated and/or approved: January 2012. Original article appeared in fall 2006 former print magazine. Bio current as of that issue. This general health-care information is not meant as individual advice. Please see our disclaimer. I throughly like reading your articles. I was looking forward to seeing some rashes from scabies, since the local school had just sent out a letter informing us parents of a breakout in the school. So I would have liked to have known what to keep an eye out for. But thanks anyways for all important info. My three-yr-old son had a terrible case of molluscum up and down his legs and encroaching on his torso. I took him to the pediatrician and was told that there were no truly effective medications and it would take up to two years to clear on its own. It was so unsightly and uncomfortable and I didn’t want it to spread to my other children. I searched the internet and found a recommendation for using Lemon Myrtle oil, diluted 5 to 1 with another oil. I dabbed that on each spot after my son’s bath each night and in the morning, as often as he would cooperate and within a month, they were ALL gone. I’ve recommended it to several friends now and their kids have also gotten rid of it speedily. Just thought I’d pass that along–it’s an inexpensive and simple treatment.